Sleep medicine is the medical subspecialty which focuses on the diagnosis and treatment of sleep disorders, which may be caused by physiological or psychological factors. Because so many other physical and mental aspects of a patient's life affect sleep patterns, there are many other medical specialties which overlap with the study of sleep disorders. Most physicians who practice sleep medicine practice it in conjunction with another medical specialty. Physicians in applicable medical specialties may study sleep medicine as a subspecialty. To subspecialize in sleep medicine, a physician typically completes an additional fellowship year of training specific to sleep medicine. Then the physician must become board certified in the field of sleep medicine. Sleep medicine is typically office based, with sleep studies completed in a sleep lab. A sleep lab has a number of beds set up to allow for patients to be monitored and recorded while sleeping. The patient spends the night in the room while being connected to equipment which measures breathing function, heart rate, and motion. Other symptoms such as snoring, talking, and sleep-walking are also observed and recorded in a sleep lab. Sleep disorders include sleep apnea (difficulty breathing during sleep), insomnia (difficulty falling asleep and staying asleep), and narcolepsy (spontaneously falling asleep), to name a few. The sleep studies are then analyzed by the physician to determine the condition and start treating the causes of the problem through diet, medication, breathing apparatus, and sometimes, surgery of the tonsils, adenoids, and soft palate. The Association of Polysomnographic Technologists (APT) recognizes three allied healthcare roles in sleep medicine. They are sleep tech trainee, sleep technician, and sleep technologist. Each of these roles requires a high school diploma and some college or equivalent experience in the health care field. 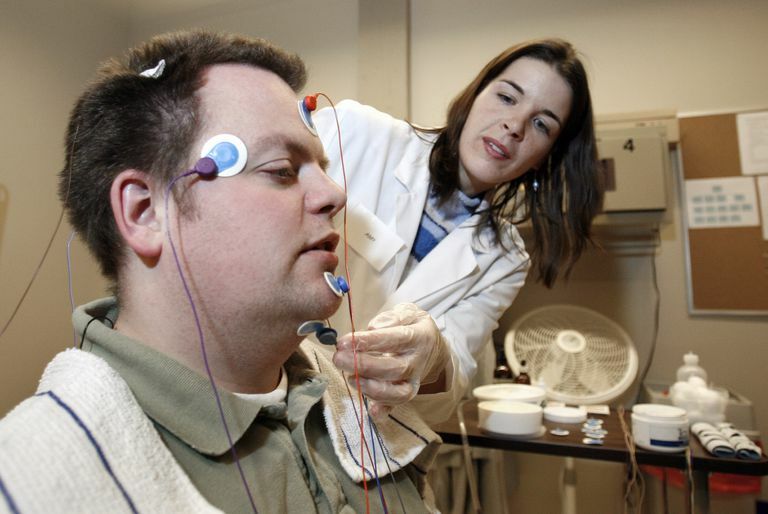 These allied health professionals are the people who conduct the sleep studies described above. The physicians then interpret the results and, depending on the results of the neurological, psychiatric, and other tests, the physician will diagnose the issue and devise a treatment plan. There are not many roles in nursing which are specifically devoted to sleep medicine, but nurses who work with medical practices in the related medical specialties of neurology, pulmonology, or internal medicine may also be involved in sleep medicine. However, sleep labs are usually fairly small and therefore do not require extensive staffs. The staff may consist of the sleep tech(s), and one other administrative person such as a receptionist and appointment scheduler. The medical, or clinical director of a sleep center is typically an MD, DO, or Ph.D. This is the person who oversees all of the studies and is responsible for the technicians and technologists doing the sleep studies. Unless the sleep center is very large, a sleep center director is usually a physician who has a full-time practice in a related specialty, in addition to their responsibilities as a medical director. In addition to the clinical director, there may be an administrative director who could be a nurse or other non-physician professional who is experienced and knowledgeable in managing a medical facility. The administrative or executive director of the sleep center would be responsible for staffing, budget, marketing, and scheduling of the sleep center.